Home Pregnancy What Does Amniotic Fluid Look Like? In common language, amniotic fluid is called as pregnant woman’s water or what people commonly as “water.” It is the protective fluid seen filled in the amniotic sac of a pregnant lady. 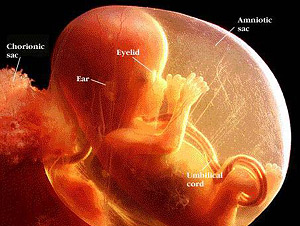 The fetus grows within the fluid, and fetus continues grow to lay in amniotic fluid. It has an important role during the growth of the fetus. One of the main function of amniotic fluid is, it protect the fetus getting jammed within the wall of the uterus as the fetus continue growing. In fact, it works like a cushioning substance. In addition, to the above, the amniotic fluid helps to absorb proteins, carbohydrates, phospholipids, electrolytes and lipids that are very essential nourishments for the growth of the baby. Two weeks after pregnancy the amniotic fluid starts developing in the uterus. Since the amniotic fluid stay within the body, there will be frequent vaginal discharges a pregnant lady can expect. These are common pregnancy related issues. It is important to know the details about amniotic fluid and let us find out what exactly are amniotic fluid and its functions. Amniotic fluid is a colorless fluid in appearance, but it is also seen in slight yellow color. It smells something very close to sweet and has no odor. It won’t have urine smell. At times during the discharge, it could be seen with whitish mucus spots and sometimes blood spots. How to differentiate between urine, amniotic fluid, and other discharges? It is common during pregnancy to have vaginal discharges, and it is difficult to understand what exactly are discharging, whether it is amniotic fluid, urine or other fluids. Some of the indications provided hereunder will help you to understand the difference. Amniotic fluid: If you are done with urination and still if you are finding vaginal discharge then it could be amniotic fluid. You can say you “water” is leaking. Urine: Frequent urination temptation is common during the second and third trimesters of pregnancy. It is because of the growth of the fetus as it will start pressing against the urinary bladder. During pregnancy the urine shall smell slightly similar to ammonium and the color of urine will be clear yellow or bit darker. Vaginal discharge: Any other discharges will be much thicker than amniotic fluid and urine. And it will be in whitish or yellowish color. The discharges may be odorless or may be with odor. What is the reason for the amniotic fluid leak? There could be much reason for the amniotic fluid leak, and the reasons are appended here. During pregnancy, you can expect amniotic fluid discharge. This is a normal phenomenon and nothing to worry about it unless it is unusual and abnormal. You have to watch the discharge if the color of the amniotic fluid is different than the standard color or with an unusual odor. Discharge with brownish or light green color is a confirmation of the first bowel movement of the baby while the baby is still in the uterus. It is a rare case and normally the baby will have its first bowel movement only after the delivery. This is called as meconium in medical terms and is a serious issue. There are chances that the bowel can enter into the lungs of the baby and create breathing problems and other complications. Babies born with meconium aspiration syndrome may have to give special medical assistance to protect it from health complications, especially breath related issues. How to handle premature amniotic fluid leak? A pregnant lady should have clear knowledge about the different form discharges during their various trimesters. If the leak is confirmed as premature amniotic fluid, then it is better to reach to a clinic where there are maternity ward facilities. Since it is considered as a risky situation for the baby and mother, immediate medical attention is necessary. We shall provide you what are the best options you can have during the various stages of pregnancy as the premature amniotic fluid leak can expect any time. In the event, if you face amniotic fluid leak, suspected as a premature amniotic fluid leak, you should immediately admit to a clinic with maternity facilities. If the symptoms are confirmed by the doctor, the doctor will immediately administer steroidal medicines to enhance the growth and development of lungs. Meantime the doctor will stop your labor and continue checking the baby’s condition especially the bay’s lung functioning. After wards, you will be provided with labor inducing medicines. You may be also given antibiotics to stop or resist any possible infection in between. Premature amniotic fluid discharge between 34 and 37 weeks are considered as a comparatively safe situation. During this time, labor inducing medicine can be given to get the baby prepared to be born. Even though it is considered as a safe situation, the moment amniotic discharge is noticed you have to seek immediate medical assistance. Any delay may lead to delivery-related complications and also possibility to have infections that will be harmful to the baby and mother. A healthy pregnant lady will give birth within 24 hours of the “water break” and any delay to have the delivery may be risky. Because there are chances to have infections and to avoid this situation, it is advised to administer labor inducing treatment. That will be a safe option for the mother and baby. So you will have two options after amniotic fluid leakage. One is to wait for natural delivery and second is to have labor inducing treatment.